Do the Laws of Nature Change with Time? When I first discovered a systems code embedded in the ancient Hebrew Alphabet, it challenged my curiosity as an inventor of high-technology. It works like a math system check when overlaid with the Bible and exposed many prophecies shrouded for centuries, being misunderstood by theologians and so causing different denominations. When I straightened out the mixed up pages in Revelation, a new puzzle picture showed up which in turn deciphered many mystery clocks in museums around the world. These discoveries eventually became a series of Babushka books aligning various concepts in parallel and confirmed by the Hebrew Alphabet Number System (HANS). HANS discerns between the Daleth dimension (this world–in this time) and the Heh dimension (the other side-spiritual infinity), which cannot be measured with our Daleth instruments of physics. For example, we have no instruments to quantify “life” and do not know how it is embedded within an atom. All that exists has intelligence implanted within it in order to make it run a certain path. Human existence must have purpose can never be random as intelligence domineers every atom to behave and conform to certain laws. “Purpose” therefore is the start of every investigation otherwise get mostly stuck in controversies and paradoxes. The Bible is the only book to give us logical answers. Applying it to science must be based on purpose. Following the trail and comparing it with modern science, I discovered that Dr. Albert Einstein theorized on the Daleth side perspective, but in this discourse, we will try to see the same physical laws from the Heh dimension perspective. I discovered that the Heh dimension is always reflected in the Daleth dimension for some mysterious reason, which makes me conclude that only a creation model can unify both dimensions sharing the same laws of physics. We can therefore find out how gravity and magnetism is manufactured and embedded within every atom, which is replicated in every galaxy governed by identical laws. Even when we do not see certain forces, we know they exist, like this invisible electricity energy in my wall socket is that instantly produces light when the switch is turned on. Therefore, in our science investigation we must first look at the purpose for existence, and why everything works so well. It must be compared with God’s Plan for Humanity linked with the underlying principle now revealed across the many pages of the Bible using HANS. The most important theme for mortals is centered on God’s Plan for Humanity ending in the prophesied eminent birth of the Saints resurrected at once on a future date. Since it was determined and planned before the foundation of the earth, we want to investigate what was laid out and how it is connected with the story of a heavenly rainbow now deciphered with spectral lines. That gets us back in history of the original universe which was disturbed by Lucifer’s rebellion in the highest government of the Heh dimension. It gave reason for God to put together a plan for reconciliation to correct what went wrong. He designed a new Jod dimension to replace our present one according to a predetermined schedule. Since the present Heh dimension is broken like a dinner plate and cannot be repaired, a plan for a new heaven – new earth was needed. This exchange of the old for the new is represented in the rainbow above God’s Throne [Revelation 4], which got my attention as a scientist. It was never explained by theologians. The Hebrew Alphabet Number System expanded my ability to link the Heh dimension with the Daleth dimension. The rainbow over God’s Throne depicted in Revelation 4 is like a prominent pictogram of supreme imperial power. It is displayed like in Roman times when an eagle was placed over Caesar’s throne. It is usually replicated on a right hand finger ring expressing supreme imperial power with a seal to imprint documents of new laws, give orders in changes of government administrations, decide over death and life and in general exercise what needs to be done among conquered nations. Once sealed and imprinted with the emblem cannot be changes and is carried out. God does the same and used a rainbow when he wanted to seal important decision either in the Heh or Daleth dimension give authority to make his order valid. For example, when God ratified a contract made with Adam in 4004 BC, the world was not totally destroyed in Noah’s Apocalypse (Flood) in 2288 BC. God made a new covenant with Noah and his descendants and sealed it with a seven color rainbow for the Daleth dimension. Check it out in Genesis. At the end of Revelation in the Bible I noticed a seven color rainbow linked with the second Apocalypse, but now it includes the Heh dimension landscape. There is a powerful angel with a seven color rainbow above his head who gives an order to execute all the fallen demon angels in the underworld of the Heh dimension, which reaches as far as the air domain of our earth. This mighty angel displays the rainbow to signify that he has the imperial infinite seal with direct authority from God. Therefore, my investigation of the rainbow in heaven got my attention and discovered in the process how the universe was created embedded with divine imperial power controlling every atom God created. Like a gigantic computer keeping track as nothing is left to chance, God ultimately decides the future or past and a time dimension even my and your life is known as it is connected to Divine Life. Do not ever think that this gigantic computer will sleep as he will remember every word you said recorded in books opened on the final day of humanity. We will now focus on a rainbow described in Revelation chapter 4, which describes a rainbow over God’s Throne with spectral lines information embedded which lead me to postulate a new donut atom theory ending in a good model how the universe was created. The heavenly rainbow has embedded spectral lines, which gives us information how a Donut Atom is formed. To understand that invisible information we must first get acquainted with spectral lines. Our eyesight is not capable of seeing invisible rays outside its range. We must not assume that a rainbow in heaven has no color or spectral lines just because it is in the Bible. I am a little scientifically inclined and do not reject information from another source just because I was only educated in present evolution religion enforced in every atheistic university claiming all the rights of science. They do not allow facts to be presented that are not conforming to the accepted political mindset. Science is now deteriorating into a nonsensical illogical morass sanctioned by the establishment as the only gospel. Writing this book opened my horizons much wider by comparing science with the Bible to discover what the other side had to say. I copied some neat information for you from the Internet. It took a long time for scientist to learn how to use a spectrum to gain insight into the universe. 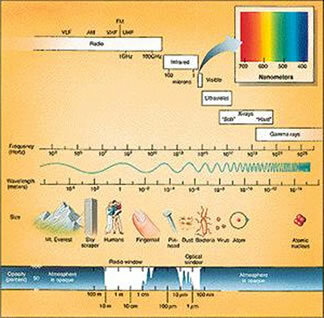 Isaac Newton (1642-1727) saw the spectrum from sunlight as a continuous band of colors. In 1802, William Wollaston (1766-1828) observed several dark lines in the spectrum of the sun. He thought they represented natural divisions between colors. Joseph von Fraunhofer (1787-1826) looked at the sunlight with even better prism; He saw 600 such dark lines in the spectrum. Then finally, Gustav Kirchhoff (1824-1887 figured out what was going on and gave the world a set of rules describing what was making both continuous spectrum that Newton saw and the dark lines that Fraunhofer saw. When German scientist Joseph von Fraunhofer discovered the rainbow colors coming from space he noticed embedded spectral lines of every element. They are now categorized in the periodic table that created new technologies utilizing his detection we could today no longer live without it. Just look at the full range of application designing various spectral analyzers used in agriculture, crime laboratories, genetic modification, DNA investiga tion, court proceedings, hospital medical examination, universities and the list goes on. Now we can expand on Mr. Joseph von Fraunhofer’s spectral line vision. Rule #1: A luminous solid or liquid emits a continuous spectrum of all wavelengths. It has no lines in it. Rule #2: A rarefied luminous gas light whose spectrum shows bright lines. These lines are called emission lines. Rule #3: If the light from a source passes through a gas, the gas may extract certain specific energies from the continuous spectrum. We then see dark lines where the energy has been removed. These dark lines are called absorption lines. Each element in the dark periodic table appears in gaseous form and will form and will produce a series of bright lines unique to that element. Hydrogen will not look like helium which will not like carbon which will not like iron...and so on. Thus, astronomers can identify what kinds of stuff are in stars from the lines they find in the star’s spectrum. This type of study is called spectroscopy. The science of spectroscopy is quite sophisticated. From spectral lines astronomers can determine not only the element, but the temperature and density of that element in the star. The spectral lines can tell us about any magnetic field of the star. The width if the line can tell us how fast the material is moving. We can learn about winds in stars from this. If the lines shift back and forth we can learn that the star may be orbiting another star, we can estimate the mass and size of the star from this. If the line grow and fade in strength we can learn about the physical changes in the star. Spectral information can also tell us about material around stars. This material may be falling onto one star from a doughnut-shaped disk around the star called accretion disk. (That will be our story next). The disks often form around a neutron star or black hole. The light from the stuff between the stars allows astronomers to study the interstellar medium (ISM) . This tells us what type of stuff fills the space between the stars. Space is not empty! There is lots of gas and dust between the stars. Spectroscopy is one of the fundamental tools which scientists use to study the universe. Now let’s examine another rainbow spectrum, but one notch higher, as it comes from God’s Throne (Heh dimension), which is the very center of the universe as reported by the Apostle John in Revelation 4. Let’s investigate these phenomena with scientific tools available through a dual railroad perspective forbidden by the atheistic academics that control universities. Not allowing the Bible to be quoted in science forums has caused degenerated monorail opinions and fairy tales elevated to a false science believed by gullible people that needs an editorial police force and lawyers to force it on the public due to a lack of evidence. Atheistic evolution cannot explain life or how gravity is generated and bound together with magnetism. This new formula converting energy of invisible infinite light creates a force for the Daleth dimension creating elements which can be seen embedded in spectral lines forming solid elements expressed in the periodic table. A creation force coming from the Heh dimension now ending on the lower Daleth dimension both coming from space and share spectral lines in a rainbow color frequencies spectrum, which has embedded intelligence information either expressed in light force spectral lines or elements crystallized out. It is like a frozen force seen in physics’ creating atoms of our material world categorized in the periodic table. Both concepts are based what comes from space stretched across a dual railroad a better balanced system much more stable. Professor Albert Einstein taught the scientific world that time is not what it seems. The Speed of Light is not constant either. Both time and light speed are affected by gravity, which means the neighborhood you are located in. Just as the moon’s gravity pulls on the earth’s oceans to make tides, so the gravity of galaxies, stars, planets and other stellar phenomena pull, bend and even consume light and time. The primary lesson for modern scientific observation is that the principle of uniformitarianism is only useful within the context of time. We have at best only a couple of hundred years of documented observations. From them most scientists extrapolate “billions of years” forward or backward through time. But Einstein taught us that, when it comes to the passage of time, what we may perceive to be taking place is distorted by our point of reference. Because we are part and parcel with the present phenomena of time, we cannot observe or measure it objectively. We need a third, external point of reference for that purpose. The primary lesson for me concerns my research into prophetic timetables. The Bible presents the divine plan, which is symmetrically designed, but many variables of relative chronological perspective exist, which makes any correlation with our present calendar very difficult. God’s symmetric patterns of history and prophecy possess heavenly design but apply to our material dimension. This means that symmetrical patterns of historical and prophetic events overlay the uneven or warped continuum of time-space of the natural universe. The alignments are moving tangents connecting curves to curves. The time-space distances are vast and ever changing, and so my researched estimates of the dates for predicted events is dated very accurately based on ancient clocks and HANS totaling 66 witnesses. Because time and space are moving curves of relative speeds and force fields, any attempt to correlate God’s prophetic clock to our own is extremely difficult. One thing is certain: God's plan for this universe is fixed. Time and again I found that the calculated dates for the events of the Apocalypse correlated with the signs in the heavens and match ancient calendars. Like the gears of a cuckoo clock, the historical and prophetic tables synchronize with the cosmic clock set in the universe from the beginning. But gravity bends time and light, slowing them down or speeding them up based on the gravitational environment. My Parabolas of Time graph plots the curve of a changing year length. Other variables may exist due to time’s capacity to bend. Only fulfilled prophecy will tell. The Apocalypse in the Daleth dimension reflects heavenly purposes. Because the prophesied earthly events and dates are linked to heavenly events, they will take place when the heavenly clock gears linking the two have moved into their appointed positions. God has set the schedule from creation. My Babushka books express scaled concepts that fit together like a set of nested Russian toy eggs. Each egg has a number of smaller ones inside that replicate the same picture but scaled appropriate to the size of each one. Similarly, an atom - as the smallest egg, replicates the pattern of the next bigger egg linking higher still to encompass the whole universe and connect with the largest egg - the Bible. The Donut Atom model reveals the structure of the universe created with purpose, crowned with humanity and connecting the Daleth dimension physical world with the Heh-spirit dimension. The infinite God (I AM) is revealed in the Bible’s description of a smaller, finite, version (Man) as an image of God. I will clarify it later with analogies about the embedded intelligence of invisible realities like the light spectrum analogue the invisible ultraviolet frequency linked with infrared color also invisible. It is like when the invisible God said in capital letters [I AM] we become the counter part spelled with a smaller letter but now appearing in the visible spectrum [i-am] expressing a dual dimension, which is similar the universe to an invisible atom a smaller egg. The infinite light is replicated in the finite energy spectrum like a scaled eternity embedded converted in finite energy and slowing down in a time dimension from a dual railroad perspective. Dr. Albert Einstein explained that a slowing time dimension influences the speed of light, which made the atom bomb possible with gigantic energy released in seconds. The sun shows the same energy conversion but at a modulated, slower release of energy without a mushroom accident; however, the Bible reports an uncontrolled big bang explosion, like Chernobyl, that took place about 6,500 years ago (4488 BC +2012 = 6,500). I ask now the question what would be the mechanism within the atom to slow down a time dimension equation to avoid a fast nuclear reaction in seconds like an atomic bomb. Understanding Mr. Joseph von Fraunhofer’s discovery of spectral lines embedded in light frequencies which can be expanded in a new donut theory not yet taught in school can give us the answer why the sun converts the same energy a little slower. Examining a cuckoo clock mentioned in previous Babushka books with gravity controlling gears in a time dimension gives us a picture what would happen inside an atom. If we would remove the clock pendulum and watch now gravity reacting within seconds activating an invisible uncontrolled force which even could jerk the clock off the wall in pieces on the floor energy released too fast. That would end a time dimension concluding in absolute Zero Time for that clock. Therefore, I thank God he engineered a pendulum system within the sun like a cuckoo clock with a time pendulum to control energy released a little slower as I would not be around to tell you about with a new theory matching physics not explained in universities. Imagining Zero time dimension demonstrated and watched a movie in Washington science museum which explained a Zero Time dimension by removing all space between atoms demonstrating that all the galaxies in the universe could be shrunk down to fit inside a one pound coffee can. That concept is no different than to postulate that the infinite Heh dimension world can be embedded in the Daleth dimension again controlled by two entropy laws postulating within a donut atom system. First Law: “Nothing” can only replicate itself into “nothing” or disintegrate formless into less then 100% ending in Taw. Looking closer, I think they just worry about income getting smaller perhaps from folks being better informed. A retired inventor-scientist never misses a challenge kept on digging to find more proof to counter ignorance made another discovery deciphering ancient bronze-gold clocks exhibited in many museums like the Aztec stone calendar and the Antikythera calculator with 32 gears in an Athens museum, a science mystery for a hundred years now deciphered in my third Babushka book, which proved even more Bible prophecy with a date. It surprised me greatly to find more clocks in museums with quite a number not deciphered by scientists. That directed me to notice that even in Genesis-Bible has embedded a world calendar a total surprise never mentioned in any science books or theological institution searching the internet. That new perspective opened more science horizon for me as I was now confronted with Einstein’s theory. He also seems to have questioned that time is not constant. That explains why recently being inundated with tons of people writing in science magazines articles how the universe was created seems stuck in hundreds of theories going nowhere. It looks like our civilization has become unhinged. No wonder. We have lost the compass of the Bible instruction book purged from every school. Perhaps it is time looking back where our civilization started to get a new perspective again as history is repeated in cycles. Discovering how ancient bronze-gold clocks work, available free on the internet, the ancient clock builders are telling us that time is not constant which in our modern time is now explained by Dr. Albert Einstein too. I notice many articles appearing in scientific magazines on new conjectures that upset a lot of scientists because they prove an evolution religion meltdown by new discoveries. That fallout has tremendous implications even for politicians perplexed by global warming, world wide energy-food shortages, the environment in trouble, oceans fished out and the list goes on and on. It all connects of how we think as fallible mortal human beings relating to the universe would make a difference. I will start at the bottom with a new atom theory fitting much better in the overall picture of science as it could end confusion as my Babushka books are designed to open a knowledge horizon a little wider which hopefully would solve some of humanity’s problems. Maybe theologians have a chance to be educated in science so that they can convince pastors that the Bible is scientific, too. The biggest quest for modern scientists is how the first atom was created that could evolve into more complex structures recognized as elements collected in a periodic Table expressed with rainbow colors spectral lines. I compare our civilization running out of energy like having a hybrid 12 cylinder car with advanced high-tech technology now even controlled from space but is now broken and lacking the mechanic not educated how to fix it caused by deficient atheistic school system no longer teaching Bible wisdom collected from 4,000 years. Just watching the news, it is getting worse that even the fuel is rapidly depleting compared to the price per gallons if you remember last years gasoline pump sticker price. Yet scientist commiserating to discover that time of our universe is running out too upsetting hundreds explained theories which will obsolete many books. Therefore let’s have another look in our changing world and examining a tree again to understand the forest but recognize its surrounding environment without it a forest would not exist back to the tree where it started to complete the circle. The beginning of our galaxy could be started with Gravity and Magnetism which are interlinked with a Time dimension. But there is another ingredient we find embedded some kind Intelligence Code giving birth to three energy frequencies nodules forming elements or mass and on top of the pyramid is a mystery life force which establishes our existence Body-Soul and Spirit. Only earth has Life embedded no other place we know of. For strange reason it is linked with Infinite Light the greatest mystery but is very essential for us as mortals giving us energy to grow food but is running out of time all connected and can be summed up mathematically in an ancient Hebrew hand rule. If you are offended by the word “God” just replace it with another word “Intelligence” to cross the bridge of ignorance. As we have learned from ancient clocks describing a parabolic time dimension, light has embedded intelligence in it and, when modified, it evolves into elements categorized in the Periodic Table according to the three finger rule of the electrical laws. I learned from recent DNA physics that a molecule or biological cell can only replicate itself with embedded intelligence, which needs a roadmap for its nucleus to propagate. Remember, entropy laws teach that we can never, ever get over 100% in an energy conversion. Do not be misled by evolution fairy tale speculation found in our school books and painted evolution monkey pictures depicting increased intelligence and complexity (requiring increased energy) levels on museum walls for lack of evidence. Another misconception contrary to science, which needs revision, is the notion that time dimension and the speed of light is infinite but becomes finite in teeter-totter crossover following a parabolic time curve. Looking at history and ancient bronze-gold clocks exhibited in museums the parabolic crossover point happened about 2,000 years ago (BC/AD) and is considered to be the fullness of the time dimension based on the 7,000-Year Table of Human History. For example, since scientists invented instruments to measure the speed of light about 400 years ago, it was proved by hundreds of calculated measurements confirming that light slowed down if we trust more in our technical instruments than the evolution religion priesthood that denies it. Any calculations for the universe must therefore be considered along a parabolic declining time curve if we want to measure energy or gravity in a conversion of mass. As Dr. Albert Einstein explained, the speed of light slowing down will affect gravity or visa versa like a teeter-totter, which will change with the difference measured depending at what point it intersects on the parabolic time curve dimension. If the speed of light was higher in ancient times, we can postulate that the higher velocity of light would demonstrate a higher biological energy conversion and consequently plants would have grown five times faster than what we measure today. They would have reproduced with more biodiversity in ancient times as more energy converted into elements due to a higher density of oxygen being available to fuel bigger DNA molecule strings. That would explain why we see embedded in fossil bones five time bigger cell structures, much bigger plant life imprinted in coal deposits, bigger trees, large leaves embedded in muck, big animals like dinosaurs in a relative short time buried in clay–sandstone deposit unending to witness around our globe. Check out the embedded air bubbles in amber a resin from five times bigger trees measuring doubled much higher oxygen content twice the fuel what we have today. All existing compressed growing in a much shorter time period just like the Bible tells us. Before the Atlantis civilization, people were much bigger like the Nephilim mentioned in the Bible. Genetic science teaches that recessive genes will reappear after so many generations being reproduced from the original imprint but never over 100% according to the laws of entropy. 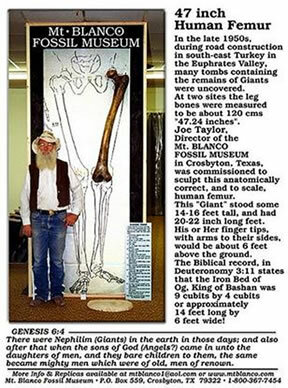 The Bible recorded that giants existed like the Amorite and Canaanite descendants of Anak or Enoch, Cain’s son. They show up as the Anakites were destroyed in Sodom and Gomorra. Another outbreak of recessive genes in David’s time made him famous killing Goliath and some of his family, all recorded to be over 9 feet tall. Check out the many complete fossil bones found in different location to witness large human beings and not a fraud perpetrated by a corrupt evolution priesthood took some bones named it “Lucie” and proclaimed it a trans specie held in a bank vault non has access to. It does not bother their consciousness collecting only 3 feet tall animal bones and lying to the ignorant public what is so obvious a deceptive fraught manipulation by an atheistic evolution religion denying science. However in this picture shown gives you fossilized skeletons collected from different location and you check it open to the public if they are authentic and come to your own conclusion not want to write another Babushka book. Check embedded in sandstone muck human footprint imprinted in a dinosaur foot print exhibited in Texas not allowed to be shown in our schools to keep you badly misinformed. Another big fruit mystery was resolved for me reading in [Numbers 13:23] that the 12 spies with Joshua and Caleb as their leader coming back from checking out the Canaanites giants the descendants of Anak and compared themselves like grasshoppers discouraged to conquer; but brought proof carrying huge single cluster of grapes from the valley of Eshkol carried by two people an unnatural size for us not possible at our oxygen fuel level. I could first not fit it in my science understanding but God revealed it at the end of this Babushka booklet. We must read the ancient Hebrew Torah text very carefully and noticed that good old Noah must have been an Italian I am sure, as most Italian immigrated in my neighborhood plant a vineyard wherever they settled. Noah fond of exceptional good wine read the story and made sure he has some rootstock saved from before the flood planting a vineyard again his joy and hobby as soon he got off the boat and planted a vineyard. That rootstock was from prehistoric grapes much bigger fruit evolved from higher oxygen fuel growing with larger grape cells. I wish I had budding sample preserved for my vineyard in California and makes some money for a change like Napa valley have a truck now which would be no problem transporting super grapes. Not understanding nature from ancient time linked with the parabolic time dimension or just plain investigating fossil cells with the microscope and wondering why are they bigger we no longer see in our time caused totally willful faulty programmed thinking postulating and imagine that the universe must be billion NASA years old which data measured from our present time but should think of a scenario if light is not constant much faster and starting from infinite which evidenced in the fossil and geological records. That would make our time dimension getting shorter too clearly stated in the Bible and proven by ancient clocks exhibited in museums. Check out the clock Babushka book. Recently on TV, I saw a giant living in China who is 15 ft tall. Explain that to me if you are a scientist. I hope you do not believe in an atheistic evolution religion but become educated in true science. We could have found more evidences of this pre-Flood civilization known to many as the ancient Atlantis civilization, but the Flood of Noah’s time in 2288 BC coincided with shifting tectonic plates and drifting continents due to a massive asteroid strike in the Gulf of Mexico. This strike is usually dated 60 million years ago, but that is a fairy tale opinion unproven. The Flood destroyed or covered up much of the evidence burying in muck and sand or under water. You can search the Internet about some underwater foundations and streets laid out from previous civilizations. Prehistoric archeology sites and ancient coal deposits evidence very big cell structures in plants, which was probably caused by twice today’s oxygen density of the atmosphere. That tells me that in the Garden of Eden, Adam and Eve must have also been much bigger than today’s rather common 6 feet. How about 18 or 36 feet tall? Theologians might flip out hearing that! Evidence for this ancient spin-axis pattern of cycles is found in the ancient Aztec calendar clock. It is also verified in Genesis, which gives us the two witnesses needed to establish facts. A positive witness is added from science if you apply the laws of physics and look into your microscope to examine the fossil record. Coal deposits testify that different climate temperatures prevailed around the world before 2288 BC. It never got too hot, and it never rained. There were no rain clouds, snow or ice on its poles. The ancient climate would grow more food for animals to support their bigger bodies just like greenhouse with its warm, moist air and lights on day and night. The huge fossil-shale-oil deposits and big mineralized trees buried in a Californian State Park near my neighborhood proves the ancient superabundance of light energy. Today, the average size of a person is 5-6 feet tall and the speed of light is 186,000 miles/sec. An elephant is about three times the length of man. 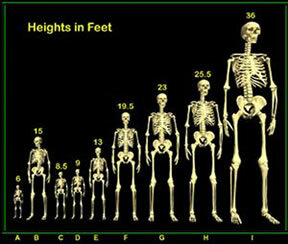 Transpose that to the picture above where we see skeletons of human giants up to 18 feet tall as photographed. I am not telling you a fairy tale as we can measure the bones! Then put that prehistoric giant next to friendly plant-eating dinosaur, and you would have the same ration of ancient human to dinosaur as modern human to elephant. Those gentle leviathans even mentioned in the Bible would make good pets like we see today in India where a little boy rides an elephant. Science fills in the missing pieces because fundamental laws in physics do not change. The proof we get in genetics is explained in my fourth Babushka book, Genetic Modification EXPOSED! It is easy to understand by the average reader. Both dominant and recessive genes repeatedly appear from the original imprint since creation. If copied a hundred times, it is the same except that the law of entropy means that some genetic loss occurs after so many generations. For some unknown reason, the most ancient prototype comes sometimes comes around again full circle: even after so many generations, it replicates the original. That is why we still look human and not like apes as some atheists believe. If the light speed would be the same today as in ancient times, it would reproduce similar life forms again 100%. But light has slowed down since then. The infinite light seems to be changed by the time dimension’s parabolic nature, which together with the less oxygen available, resulted in our modern plus or minus 6 foot people. Today, light takes 8 minutes to arrive on earth from the sun, which is a little longer than in ancient times. When this shift first occurred, massive extinctions resulted due to the rapid downhill curve of less energy available. Even the Bible faithfully recorded the existence of giants two to three times bigger than the average. Outbreaks of gigantism seem to occur in 500 year cycles. So do not just lay away this unheard story not matching fairy tales taught in schools but test it out with true science not biased by an evolution religion. I mentioned a hybrid racing car lets say 500 horsepower. When we accelerate from slow to very fast we will need more gasoline fuel when it runs highest. Bigger energy conversion makes for higher horsepower creating bigger biological DNA structures measured in RPM on a car performance. That means higher velocity light in the cylinders gets you to run over 300 miles an hour more energy available as the time is getting shorter covering the same distance if you understand my analogy. Our universe runs with the same laws now better explained with a donut theory making a lot more logical sense not found in schoolbooks. In this report we will collect a lot of evidence to support a better theory seeing gaps in our thinking, like the two Pioneer Spacecrafts a decade ago reported heading out into solar system at speed too high to be explained by standard theory of gravity still controversial not explained. Other spacecrafts flying past Earth several years ago gained more speed than can be accounted for by Einstein theory of gravitation stated by Ron Coven astronomy editor of Science News. That proves my projection of an asteroid already in an 825 day orbit calculated to hit the earth in not about 2020 but earlier on 17 September 2015 as indicated from ancient clocks and HANS overlaid with the Bible explained later. Theorizing about the absence of electrons of the first stars born emitting enough ultraviolet light to re-ionize the universe by stripped off atoms should question our atom theories. In my donut theory I have no use for electrons creating a fog of scattered microwave polarized back ground radiation as I think it is only an opinion but does not exist just like the other fairy tale now postulating that dark mater to be 23.3% and Dark energy 72.1% leaving only 4.6% not much leftover ordinary matter to stick on my refrigerator converted to a magnet. Alleged the first stars began to shine when the universe was no older than 430 million years. That is 3% from the beginning 13.7 Billion orange years. The Aztec-Bible-Antikythera clock calendar gives us a different shorter ratio more truth worthy as it is measured on a declining exponential parabolic time apple year curve. Knowing the different fruit can tell you the real time and would change many theories. The Bible tells that light and time runs on a dual railroad better balanced as a system with a schedule according to purpose ending on the last station the ancient Hebrew defined it with Taw. Since I mentioned a schedule for humanity in the time dimension like an international train in Europe is timed to the minute shows that God’s Plan for Humanity has arrived at the 13th station (Chet) designed for mortals now encoded in the Hebrew Alphabet Number System. Only one more station to go to finalize God’s Plan for Humanity, which must be seen in context of the purpose for the universe’s existence. Seeing intelligence embedded within every atom and DNA molecule can only be answered through the coming Apocalypse from the Bible perspective explained in Babushka books. The Apocalypse is the apex for Humanity’s existence and became the reason why is there a universe in the first place. It comes with a schedule of 14 stations like an international train in Europe and has on the 13 th station an astrological event equivalent of an asteroid already in orbit hitting the earth again. The Apocalypse is linked with the birthing the Saints with a placenta a corrupted bloody evil world system removed and discarded with precise programmed clock gear cycles which will reveal the reason why I and you exist on this planet. The First Resurrection of the Saints is analogous like butterflies appearing in one day gathered by the ten thousands demonstrated in Mexico as God always used nature to illustrate principals belonging to God’s management in dealing with Humanity. That is why science is so exiting for me seeing the Heh dimension (the other side) replicate in the Daleth dimension (this world in this time) since we are so ignorant of so many realities not understanding God’s plan for us and must fill the pot holes lacking understanding with fairy tales. Read the next story what atheistic scientist write being blinded by their rebellion denying that they have a divine life breathing within, or explain what is that life pulsating in you and me looking at a dead body if you do not know the difference. Therefore, the universe is inside you and me like a tiny insignificant seed has a parabolic time dimension embedded sleeping to be resurrected linked with intelligence programmed to be a tree. Those principal laws are duplicated a thousand times expanded into space with galaxies sharing the same atoms bathed in infinite light to give it energy for its existence. If we are logically inclined to think further and start with an atom and then only then can we explain the universe not from our ignorant fairy tale perspective but use information outside our closed-loop system. It is problematic for many scientists not understanding what lays beyond death the Heh dimension clearly stated in the Bible. Now let’s read an opinion from another quarter and compare it with my story analyzing what is happening to be better informed to delineate eventually truth from fiction reading what some scientist now postulate thinking about Einstein’s theory time dimension getting smaller quoting. After that I will tell you a new atom donut theory and a lot more investigating a universe from the Heh perspective matching the Bible for full rounded 360° movie projection only very few people experienced. That should widen our knowledge horizon worth spending the time reading my story. Reporter: Nick Grimm interviewed JOHN HIGHFIELD and Dr. Jeff Bicknell an astrophysicist at the Mount Stromlo Observatory in Canberra. JOHN HIGHFIELD: These days it seems any, or all, of our most-cherished ideals can be challenged. A research team, led by the eminent cosmologist Professor Paul Davies of Macquarie University in Sydney, has certainly come up with a challenge to orthodox wisdom, that contained in Einstein’s Theory of Relativity, E=mC 2. Based on observations of quasars in deep space the team has speculated that the speed of light is not as constant as the formula specifies. It is, in fact, slowing down. As Nick Grimm reports, if they’re right, it could open up all sorts of once-unimaginable possibilities. We still don’t know where most of the mass in the universe is to make the equations add up. And that’s got to tell us there are some big unknowns there still. JEFF BICKNELL: I think it’s a very interesting speculation. It depends upon some observations which while extremely good are still marginal. We’re not totally convinced by the argument itself. Our feeling is that a bit more work needs to be put into that to actually come to that fairly dramatic conclusion. NICK GRIMM: OK, well given your reservations, if this was the case, if this does represent a new physical law that we need to grapple with, what are likely to be the consequences of that? JEFF BICKNELL: Well quite dramatic. If the speed of light gets faster as we go back in time, then that means parts of the universe can interact or communicate with each other much more readily. And I think as Paul Davies himself noted this morning, this would be another explanation for why the universe could be so uniform on such large scales. 2- Do the Laws of Nature Change with Time? One of the great successes of the Big Bang theory is that Big Bang Nucleosynthesis (BBN) calculations predict relative abundances of the light elements (such as Helium, Lithium, Deuterium) which agree well with observations. In order to understand the past and future expansion history we need to know the total energy density of the universe. An experimental measurement, to confirm or deny that light is slowed in a gravitational field, is very important. The principle of equivalence, which underlies GR, is based on the concept that an observer in a closed elevator cannot tell the difference between acceleration and the existence of gravity. If  is confirmed, the observer need only measure the speed of light within the elevator in order to distinguish between the two possibilities. This slowing of the velocity of light in earth’s gravitational field is rather small, and is in fact right at the edge of our ability to measure it. It has cosmological consequences, however, for black holes and other places of high gravity. It is amusing to consider that light in the vicinity of a black hole may move exceedingly slowly. Another interesting possibility is “faster than light” travel. By this, I mean that accelerators can produce particles with speeds arbitrarily close to “c”, and perhaps even in excess of “v” in earth gravity. These fast particles would then be expected to emit Cerenkov radiation in a vacuum! A quick calculation suggests that needs to exceed 1-7*10-10. This leads to of 0.267*105, or energy for an electron of about 14 Bev Beyond this energy, a Cerenkov loss mechanism should be expected even in a perfect vacuum. Such a finding would support , and may be more feasible than a direct measurement of velocity. Cosmologically, a Cerenkov mechanism for pulsars may be more common than one might think, since gravity slows the velocity of light. This conclusion, that gravity slows the speed of light, speaks directly to the nature of gravity. GR finds that gravity distorts space, and appears not to contemplate any change of the speed of light. This paper finds, using the “apparent mass of radiation” concept of SR, that gravity reduces the speed of light. A gravitational lens causes additional deflection of a glancing ray of light, equivalent to doubling the tug of gravity. Each gives the right answer, but the explanations differ. In conclusion, it has been shown that SR can account fully for the deflection of starlight without invoking GR. Half the deflection is accounted for by a direct gravitational tug on the photon and half is a consequence of the slight reduction of the velocity of light in a gravitational field (equivalent to a varying index of refraction). This explanation then agrees wholly with the 1.75” of arc deflection found experimentally for starlight grazing the sun. It is worth repeating that, aside from the postulate that moc = mv accounts for conservation of linear momentum, this is a no-parameter fit with experiment. If confirmed experimentally,  denies the equivalence principle on which GR has been formulated and puts into jeopardy the formulae of GR. A scientist at the University of Sydney in Australia conducted an experiment that slowed down the speed of light 16%. This accomplishment is the first step toward an all-optical Internet that will be a thousand times time faster than today’s Web. The optical circuits work best when light travels slower than its normal speed of 186,000 miles per second. Thus, a number of scientists refer to the speed of light slowing down. This phenomenon can be understood much better from Donut Atom model. In the first discussion, reporter Nick Grimm mentioned the big unknown question is the mass of the universe to make the equation add up. The paradox is that we see at the same time an expanding and a shrinking universe from a Heh dimension to Daleth dimension perspective. Both project the universe like a snapshot of the past, but aligning the pictures on top of each other will never make the equation come out right. The past is frozen. What we see now cannot be determined as it is an expanding or frozen time dimension, hence a constant speed of light was postulated. Observation in the second case with lighter elements agreeing with one side of a theory but still does not give the needed total energy density of the universe. That is not possible as the infinite energy unknown by scientists replaces the lost energy eaten up by Kelvin cold. The friction within every atom cannot be measured - just like neutrinos do not have mass, though they work within the atom forming elements, as explained later. Light in a curved pattern can be observed in the first stadium of forming galaxies with a big hole starting with two polar arms swirling around like a North-South polarity moving in tighter circles ending in a black smaller hole concentrating the highest gravity producing light 90° to the proton movement within the Donut atom according to the three finger electrical law rule. But light going through gravity is still a problem. Observing the moon a little closer tells us that he is moving away from earth at a rate of two inches in a year. This means that every year you weigh about one potato chip less than you weighed the year before. That means that the older you get, the softer you will hit the ground. Five hundred billion years from now, you would fall out of a really tall tree and never hit the ground at all. You float and fly seen in a space craft orbiting the earth. Now that is something to look forward to. The Bible’s Saints of the First Resurrection will not need five hundred billion years to see the universe. They will float through space in seconds through the Jod dimension as Jesus demonstrated by walking through walls and rising to heaven without a helicopter. Check out the Gospels and Acts. It’s comforting to know there’s hope for the future. Now let’s read another opinion from the expert raising the bar of controversies which could end up with a better explanation investigating Donut Atoms. If the atom is not connected to the universe we have a very poor model going nowhere. Remember a little thing called the space-time continuum? Well what if the time part of the equation was literally running out? New evidence is suggesting that time is slowly disappearing from our universe, and will one day vanish completely. This radical new theory may explain a cosmological mystery that has baffled scientists for years. Scientists previously have measured the light from distant exploding stars to show that the universe is expanding at an accelerating rate. They assumed that these supernovae are spreading apart faster as the universe ages. Physicists also assumed that a kind of anti-gravitational force must be driving the galaxies apart, and started to call this unidentified force "dark energy." However, to this day no one actually knows what dark energy is, or where it comes from. Professor Jose Senovilla, and his colleagues at the University of the Basque Country in Bilbao, Spain, has proposed a mind-bending alternative. They propose that there is no such thing as dark energy at all, and we’re looking at things backwards. Senovilla proposes that we have been fooled into thinking the expansion of the universe is accelerating, when in reality, time itself is slowing down. At an everyday level, the change would not be perceptible. However, it would be obvious from cosmic scale measurements tracking the course of the universe over billions of years. The change would be infinitesimally slow from a human perspective, but in terms of the vast perspective of cosmology, the study of ancient light from suns that shone billions of years ago, it could easily be measured. The team's proposal, which will be published in the journal Physical Review D, dismisses dark energy as fiction. Instead, Prof Senovilla says, the appearance of acceleration is caused by time itself gradually slowing down, like a clock with a run-down battery. “We do not say that the expansion of the universe itself is an illusion," he explains. "What we say it may be an illusion is the acceleration of this n expansion - that is, the possibility that the expansion is, and has been, increasing its rate." If time gradually slows "but we naively kept using our equations to derive the changes of the expansion with respect of 'a standard flow of time', then the simple models that we have constructed in our paper show that an "effective accelerated rate of the expansion" takes place. "Our calculations show that we would think that the expansion of the universe is accelerating," says Prof Senovilla. The theory bases its idea on one particular variant of superstring theory, in which our universe is confined to the surface of a membrane, or brane, floating in a higher-dimensional space, known as the "bulk". In billions of years, time would cease to be time altogether. "Then everything will be frozen, like a snapshot of one instant, forever," Senovilla told New Scientist magazine. "Our planet will be long gone by then." One more interesting article showed up my friend send me written by John Web. I will copy some of his introduction because it helps to understand a new Donut Atom theory. Check out the rest as I am usually disagreeing with many scientists opinions not educated in their various garden varieties of speculations but could widen our horizon for a better understanding of true science. What do we mean by “the laws of nature”? The phrase evokes a set of divine and unchanging rules that transcend the “here and now” to apply everywhere and at all times in the universe. The reality is not so grand. When we refer to the laws of nature, what we really talking about is a set of ideas that are striking in their simplicity, that appear universal and have been verified by experiment. It is thus human beings who declare that a scientific story is a law of nature, and human beings are quite wrong. The development of scientific theory has always followed the need to understand an observation for which no satisfactory explanation previously existed. When developing new theories, physicists tend to assume that fundamental quantities such as the strength of gravity, the speed of light in a vacuum or the charge on the electron are all constant. And when theses theories are found to predict the results of new observations, our belief that theses quantities are actually fundamental constants become even stronger. Moreover, despite the rapid changes in technology in recent decades the timescale on which fundamental new discoveries in physics are made is typical comparable to a human lifespan. This means that theories developed decades ago can appear as they have been carved in granite. The end result is a natural reluctance to change the understanding of the world. But it is vital to remember the limitations that have been involved in the testing theses assumptions. Many of the experiments we carry out to test theories are restricted to the here and now -the Earth-bound research labs or to the small part of the universe that we can observe with telescopes. If we would some how do our experiments in a different place or at a different time, that is what appears to happen when we measure something called the fine-structure constant in the very distant past. The question first posed by Paul Dirac 1937, “Have the laws of nature remained the same since the Big Bang some 13.5 billion years ago?” He attempted to link the strength of gravity with various constant and numbers that characterize the small scale properties of the universe. In doing so, he claimed that one of the constants of nature, the strength of gravity, should change time. The fine–structure constant of (alpha) is a measure of strength of the electromagnetic interaction and there are reasons why (alpha) and other dimensionless constants might vary with time. Theoretical physics aims to find a single unifying theory that describes four fundamental forces not yet discovered. (1) Gravity; (2) electromagnetism; (3) strong; and (4) weak forces. If such a theory is not found, a great deal of the elegance and beauty of fundamental physics will be lost. When science is not based on facts, it cannot postulate sound theories as the geometry of an atom must be replicated in what we see in galaxies. Therefore, the same laws in physics must be applied to both dimensions being the same on the microscopic level expanded to the universe - both changed into a finite frozen state through Satan’s rebellion 4488 BC. That notion from the Bible and ancient bronze-gold clocks exhibited in many museums will raise the blood pressure of many atheists controlling the universities. However if you want to have fun exposing biblical buried pearls, enjoy this new Donut Atom theory matching many mysteries found in the Bible, which also explains science with a better model. Do not be offended by pocking a little fun at fairy tales believed by many atheistic scientists from the past century. But nevertheless I need some specialized help and wish that someone could help me defining my donut theory a little better which could explain physics still not yet defined in our modern age. Looking around daily new science discoveries appearing in magazines and wondering why nobody at this time can define gravity, magnetism and now light slowing down and screwing up a time dimension. Time must have been measured more accurate in ancient times judging by 100 pound pure gold clocks exhibited hanging in museums not deciphered by evolution believing scientist. New theories in physics getting wilder with turbulent ideas making money writing books even postulating that entropy laws can be modified over 100%. Gene scientists in a mad rush to screw-up our food supply mixing and matching strange genes together from different species hoping for higher profit. I remember the good old days where science was simple and still made logical sense with atoms considered the smallest part which in a model behave like a ball in the center with an electron going around, around a billion times forever. Then we have learned that even the ball nucleus is dividable like positrons–neutrons some are charged positive the other neutral. All squeezed together by the encircling electron. Then the positron became proton as more particles showed up in atomic smashers. Left out was of course magnetism a strange force we think of a horse shoe magnet playing as a kid. Some scientist tell me in the inner earth has flip flopping horse shoe magnets a little denser as some other scientist from another tribe swears that the inner gravity boiling center is so hot no elements can form hence no magnets still dissolved in its primordial soup or some other imaginary mass no one seems to know what it is for lack of evidence. Then on top to be informed by Doctor Albert Einstein that light is slowing down around the gravity center like seeing a motorcycles cop just in time reducing my 10 miles over the speed of light limit in two seconds projecting Einstein’s theory using the hand breaks so that the red shift light in the rear of my speeding car does not light up passing gravity possibilities applying physics learned in school creating a big bang for me costing some money. Years ago, building part of the Linear Accelerators in Stanford Palo Alto as a technician with lower pay, had some fun assembling a gun to smash atoms. I remember if scientist found new particles in the Nebel-chamber that gave reason for a party with donuts. Then I read now in [Science Magazine, February 23, 2008 by Ron Cowen: “Stellar Switch – Sun not alone in making magnetic flip-flops”] to get educated just in time what happened in the sun. If we cannot explain physics on earth lets look at some distend stars still burning which avoids confrontation with those who believe in intelligence not allowed in public schools. It is safer to look far away no one can argue with some of the magazine articles that the sun is converting Hydrogen into Helium in atomic fusion so hot that no metals or other elements can form not yet cool enough to crystallize out as magnets. How come there are magnets flip flopping in the center of the sun and for that matter even the earth as reported? I suggested moving Stanford laboratory on a space station around the sun for better observation but nobody would listen not having a degree in the brotherhood. My understanding working with klystrons at EIMAC in the early days of Silicon Valley and developing quartz-silicon Klystron windows 10 times more energy efficient transmission wise used on the accelerator gun to give us a bigger bang for the bugs. Aluminum-oxide windows won out as my boss changed jobs separating a world we live in from pure vacuum. Walking around a big gun gave me a perspective of high energy, magnetism applied in ultra pure vacuum working with refractory metals with melting points several times higher then iron. Projecting what I learned to the inner core of a burning sun surrounded with a vacuum of a dense gravity explained so high it would not allow elements to be formed with our present theory looking like my nickel-iron magnet stuck on my refrigerator. Therefore the magnetic center flip flopping on the sun is pure fantasy from the evolution atheistic priesthood controlling universities not allowing intelligence embedded in a cell to be taught in our school or we have another unexplained phenomena not discovered yet. Then comes along Dr. Albert Einstein and from that time we can now see the other side of the same coin that all what is so solid like electron traveling at high speed around the nuclear ball is just energy. The seven rainbow colors coming from space emit light from a distant burning star, which has imbedded spectral lines discovered by Mr. Joseph von Fraunhofer, like myself a German. These seven rainbow colors are the same found on our earth composed of energy in various frequencies now recognized as copper, silver, hydrogen and especially Helium discovered later on our earth too. Now over hundred elements as defined in the periodic table we can touch like my kitchen magnet on my refrigerator. Then I am surrounded by so many pagan scientists believing in a 100 year old evolution religion not understanding entropy laws postulating an expanding universe and have faith that the speed of light would not change a beloved fairy tale story of unproven phenomena’s now disputed by an expert champion in science Dr. Albert Einstein. It seems that light is adjusting some times stretches and contract in a gravitational field which would throw out a beloved red shift pet theory if you are honest and not brainwashed in a false science believing that somehow we get over 100% in an energy conversion. I wonder why we no longer teach entropy laws in schools or mention it in universities in conflict with an atheistic evolution religion. I am not educated with a degree just a technician but asked the question how can intelligence be manufactured out of nothing upsetting entropy laws not possible which therefore we can fly an airplane before it is invented. Or believe that if a frog is kissed by a handsome teenager mostly female if you are not confused with your gender and teach our kids in school believing that energy can be converted over 100% bypassing entropy laws like the First Law of Thermodynamics. That modern perspective created a whole new industry of scientists mixing and matching genes working very hard wishing for more profit in the agricultural business. Even my first born girl applying physics educated in an evolution theory enforced by lawyers and police force excluding other proofs not allowed in our schools now strongly believes in kissing (a frog my observation) her boyfriend would change into a handsome prince for happiness in denial of entropy laws. Sometimes even children’s fairy tale stories are hard to accept if you are scientifically inclined working along educated degreed person believing evolution pagan religion. Now I have grown a little older and see the world from 360 degree perspective and perceive a lot of things not detected in the universities believing in obsolete theories. Confused scientists behave not ethical like in the absence of fossil evidence hiding million bones collected in drawers locked up tight away from the public eyes. Being suspicious not finding any fossil bones assembled in a complete trans-specie fossil example like seeing dinosaurs bones mounted for an impressive display in many museums our atheistic priesthood fixed the problem by painting their unscientific opinion on most museums wall for lack of proof. That should teach us science to our kids where grandfather came from. My second kid, a little smarter, told me I like the monkey painted next to the modern scientist evolution sequence looking like grandpa perhaps making that reference not being helpful explaining how her I-pot worked. Now back to another science opinion not popular with adults hiding in universities thinking about another atheistic fairy tale converted in computer graphics to show it on TV for gullible people or kids. What is the intelligence cooking it all together? Not finding the answer much confusing explained in science magazines like; black hole, tunnels shrinking and expanding, wormholes-literally shortcuts through space-time caused by the curvature of the universe itself. Are they only figments of mathematics coming from people postulating children fairy tales? Somebody in authority probably came up with the idea of a “non-traversable wormhole” and said you need a repulsive force with negative mass and negative energy. The only thing what is negative in my life is my bank account not getting paid from a university no longer building an electron gun. But no kidding, serious, I cannot get rid of a donut idea unless someone shatters it with true science and I don’t care if it hurts as it would help to inflate my ego bubble. Now I will be explaining my new found donut theory and present a different science opinion which hopefully would prepare the ground to look deeper in the mystery of the universe connecting with your spiritual Heh dimension. Shine on you crazy internet, by Jebediah Reed, Popular Science, March 2007. Read Pearl #116 Bible Written to Introduce Jesus Christ. Through the Wormhole, by Michio Kaku. DISCOVERY, March 2008. Section 3- New Model of Atomic Structure Described.